Purpose: Complications of pneumonia development in patients with chronic obstructive pulmonary disease (COPD) receiving inhaled corticosteroid (ICS) therapy have been documented. The aim of this study was to focus on clinical efficacy and the incidence of pneumonia between COPD patients receiving medium and high doses of ICS. Patients and methods: This prospective, randomized study included COPD patients identified from three tertiary medical centers from 2010 to 2012. The patients were randomized into two groups: high dose (HD; fluticasone 1,000 µg + salmeterol 100 µg/day) and medium dose (MD; fluticasone 500 µg + salmeterol 100 µg/day). Lung function with forced expiratory volume in 1 second (FEV1), forced vital capacity, and COPD-assessment test (CAT) were checked every 2 months. The frequency of acute exacerbations and number of pneumonia events were measured. The duration of the study period was 1 year. Results: In total, 237 COPD patients were randomized into the two treatment arms (115 in the HD group, 122 in the MD group). The FEV1 level was significantly improved in the patients in the HD group compared with those in the MD group (HD 103.9±26.6 mL versus MD 51.4±19.7 mL, P<0.01) at the end of the study. CAT scores were markedly improved in patients using an HD compared to those using an MD (HD 13±5 versus MD 16±7, P=0.05). There was a significant difference in the percentage of annual rates in acute exacerbations (HD 0.16 versus MD 0.34, P<0.01) between the two groups. The incidence of pneumonia was similar in the two groups (HD 0.08 versus MD 0.10, P=0.38). Conclusion: COPD patients treated with high doses of ICS had more treatment benefits and no significant increases in the incidence in pneumonia. Higher-dose ICS treatment may be suitable for COPD therapy. Previous studies have confirmed that receiving inhaled corticosteroid (ICS) regimens can decrease the frequency of COPD exacerbations and improve quality of life.11–13 The Global initiative for chronic Obstructive Pulmonary Disease (GOLD) guidelines strongly recommend that group C or D patients should receive ICS treatment combined with a long-acting β-agonist (LABA).14,15 Although ICS treatment reduces the exacerbation rate and frequency of COPD, ICS therapy has been reported to increase the risk of developing pneumonia.16–19 However, other studies have reported that the risk of pneumonia is not related to ICS usage.20–23 Moreover, a large observational study reported that the prior use of ICS was independently associated with a decreased risk of short-term mortality and mechanical ventilation use after hospitalization for pneumonia in patients with COPD.24 Cheng et al also reported no increased risk between the incidence of pneumonia and dosage of ICS.25 The optimal dosage of ICS treatment for COPD patients remains unknown. The advantages and disadvantages between high and medium doses of ICS in combination with a LABA need to be clarified, and the optimal dose of ICS therapy to provide the greatest benefits in terms of anti-inflammation response and lung-function maintenance needs to be elucidated. Only a few prospective studies have focused on these important issues. The aim of the current prospective, randomized study was to investigate treatment efficacy with high and medium doses of fluticasone in combination with salmeterol in COPD patients, with a special focus on lung function and the risk of pneumonia. A prospective, randomized, nonblinded study was performed over 1 year in three tertiary medical centers. COPD was diagnosed according to the medical history, physical examination, chest radiographic findings, and pulmonary function tests suggested by the American Thoracic Society guidelines.14 The inclusion criteria were chronic airway symptoms and signs with cough and sputum, shortness of breath, wheezing and persistent airway limitations (defined as postbronchodilator forced expiratory volume in 1 second [FEV1]/forced vital capacity [FVC] <70% and FEV1 <80% of the predicted value via spirometric data), FEV1 reversibility after inhalation of 200 μg salbutamol of less than 12% of prebronchodilator FEV1, and a smoking history of more than 10 pack-years. Subjects (over 40 years old) with COPD diagnosed for over 6 months prior to screening were included in the study. The exclusion criteria were: life-threatening COPD with acute exacerbations developing within 1 year; patients who had visited the emergency department or had been hospitalized for a COPD attack in the month prior to screening; systemic corticosteroid prescriptions in the 4 weeks before screening; those without a history of smoking or the equivalent of less than 10 pack-years; significant airway reversible responsibility with an asthma pattern; active pulmonary tuberculosis disease; and clinical respiratory tract infections documented in the 4 weeks before screening. Patients receiving medications that would interfere with bronchospasm and/or changes in lung function were also excluded. The patients were randomized 1:1 into one of two treatment groups: high dose (HD) and medium dose (MD) ICS. The definition of an HD of ICS was fluticasone 1,000 μg/day, and the definition of an MD was fluticasone 500 μg/day. Both treatment groups received salmeterol 100 μg/day, administered via a hydrofluoroalkane pressurized metered-dose inhaler with a space device (GlaxoSmithKline, London, UK). Randomization was conducted centrally by means of a computer-generated random-number sequence. Definition of an acute exacerbation of COPD was an acute event characterized by a worsening of the patient’s respiratory symptoms beyond normal day-to day variation leading to a change in medications.14 Chest radiographs were performed and evaluated by the investigators (respiratory physicians) when an exacerbation of COPD was detected. Pneumonia was diagnosed if there was radiographic evidence of a pulmonary infection (new consolidation and/or infiltrates on the chest radiograph). Sputum Gram staining and bacteria cultures were performed. In addition, sputum acid-fast staining and tuberculosis cultures were also checked if tuberculosis infection was suspected clinically. If chest X-rays were not available, the patients were not enrolled into this study. 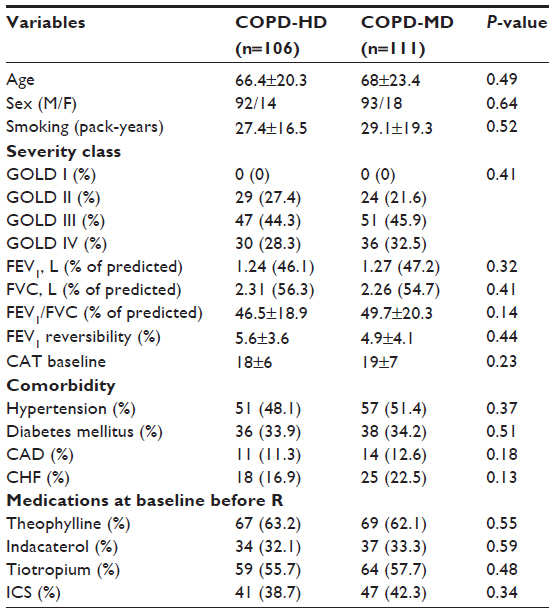 During the 52-week study period, the patients underwent evaluations of clinical parameters including spirometry (FEV1 and FVC) and symptom score with the COPD-assessment test (CAT)26 for interventions. The CAT is a questionnaire assessing globally the impact of COPD on health status. Spirometry, CAT, and clinical parameters were evaluated at study entry, at the 1-month visit, and then at visits every 2 months throughout the study period. The primary end points were comparisons of lung function from entry to the end of the study, and the incidence of pneumonia. The secondary end points included the association of health-related quality of life with CAT scores, and time to first acute exacerbation. Adverse events were documented with spontaneous reporting and patient interviews. Ethical approval was received from the hospital, and informed consent was obtained from all study subjects. The sample size calculation for the trial (n=210) provided 90% power to detect a 30% increase in the improvement of lung-function status in the HD group compared with the MD group. Categorical variables were compared by the χ2 test, and continuous variables were compared using Student’s t-test. A P-value of less than 0.05 was taken to be statistically significant. Fisher’s exact test (qualitative data) or an analysis of variance (quantitative data) was used to assess the homogeneity of the treatment groups. A Hosmer–Lemeshow goodness-of-fit test was performed to help decide whether the model fit the data well. Intention-to-treat analysis was performed for the subjects who were lost to follow-up. All statistical parameters were analyzed using SPSS software version 10.0 (SPSS, Chicago IL, USA). This study was initiated in June 2010. 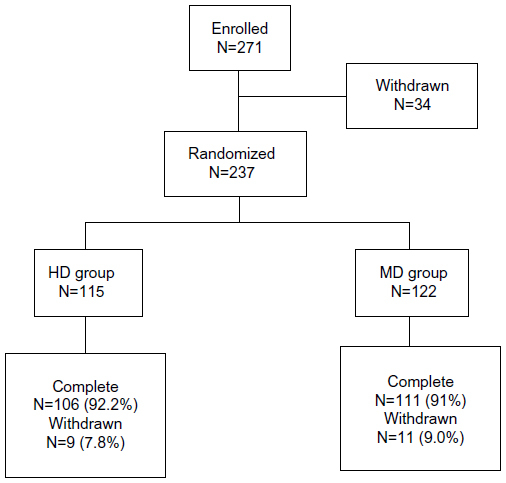 A total of 237 patients were randomized into the two treatment arms (115 patients in the HD group, and 122 in the MD group), of whom 217 (91.6%) completed the study and 20 (8.4%) did not (Figure 1). There were 36 patients with bronchial reversibility during the screen period. The rate was 11.8%. These patients were excluded due to the inclusion criteria in the study (FEV1 reversibility <12%). Among the 20 patients who did not complete the study, 12 withdrew due to a lack of therapeutic benefits (six in each group), four were lost to follow-up, and four withdrew informed consent. They were not out of the study because of adverse events. Exclusion of these data did not affect the efficacy analysis. Abbreviations: HD, high dose; MD, medium dose. Patient demographics and characteristics of the HD and MD groups are listed in Table 1. Most patients (85%) were male, and had an average lung function (FEV1) that was classified as GOLD III status (46.1% of predicted in the HD group, and 47.2% of predicted in the MD group). There were no significant differences between the two treatment groups before the run-in study. There were no significant differences in ICS and other prescribed medications, including bronchodilator agents and theophylline utilizations, or underlying comorbidities between the two groups either. Mean baseline CAT scores were 18±6 in the HD group and 19±7 in the MD group. Notes: All values are shown as means ± standard deviation. Abbreviations: HD, high dose; MD, medium dose; GOLD, Global initiative for chronic Obstructive Lung Disease; FEV1, forced expiratory volume in 1 second; FVC, forced vital capacity; CAT, COPD-assessment test; CAD, coronary artery disease; CHF, chronic heart failure; R, randomization; ICS, inhaled corticosteroid. Analysis of the primary end point of pulmonary function status with FEV1 and FVC revealed that the patients showed improvements in lung function in both treatment groups during the study. However, a greater increase in FEV1 level was detected in the HD group compared to the MD group (HD 103.9±26.6 mL versus MD 51.4±19.7 mL, P<0.01), and improvements in FEV1 from baseline in the HD group were observed at every time point measured throughout the study, especially in months 10 and 12 (Figure 2). The level of FVC was also more improved in the HD group than in the MD patients (HD 218.4±46.2 mL versus MD 107.8±38.9 mL, P<0.01) (Figure 3). Patients receiving higher doses of fluticasone had a greater improvement in lung function. 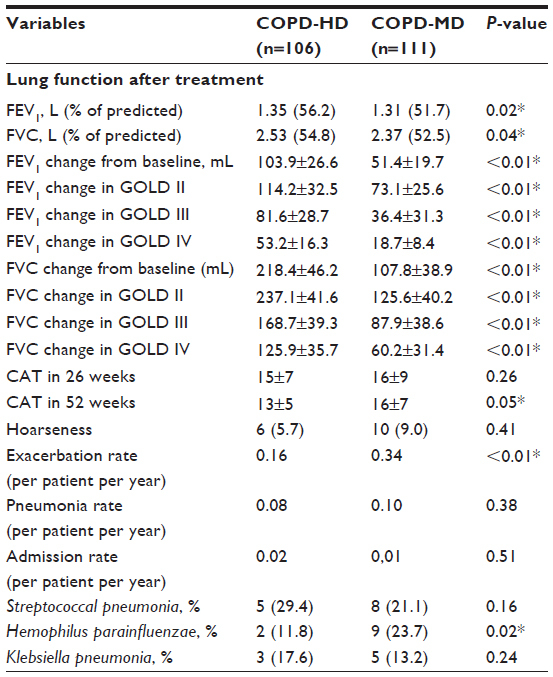 Among these patients, levels of lung function were more significantly increased in the GOLD II subjects after higher-dose treatments. Figure 2 Change in forced expiratory volume in 1 second (FEV1) in chronic obstructive pulmonary disease patients with high-dose (HD) or medium-dose (MD) treatment. 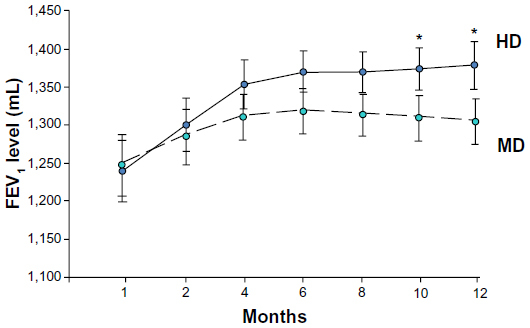 Figure 3 Change in forced vital capacity (FVC) in chronic obstructive pulmonary disease patients with high-dose (HD) or medium-dose (MD) treatment. 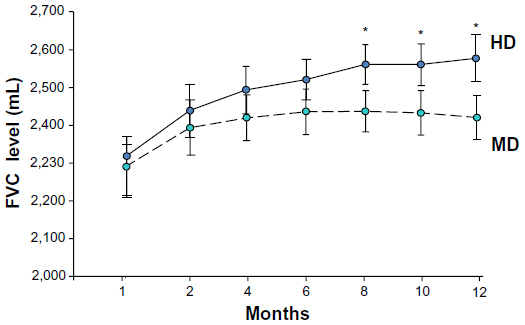 Patient-assessed COPD symptom scores with the CAT were lower in the HD group (15±7) compared to the MD group (16±9) at 6 months. Overall, CAT scores decreased in both groups throughout the study, with a statistically significant difference in favor of the patients in the HD group (13±5 versus 16±7, P=0.05). There was a trend of a higher quality of life among patients who received continuous higher ICS treatment. Absolute changes from baseline regarding decreases in the mean scores of the CAT also showed a significant difference between HD and MD patients (6±2 versus 3±2, P=0.05) at the end of the study. Seventeen episodes of acute exacerbations were detected in the HD group (0.16 per person-year): seven subjects who visited the emergency department, eight who received additional medication treatment, and two who required hospitalization. However, 38 episodes of acute exacerbations (0.34 per person-year) were noted in the MD group: 16 who visited the emergency department, 21 who required additional medications, and one who required hospitalization. There was a significant difference in the percentage of annual rate in acute exacerbations (0.16 versus 0.34, P<0.01) between the two groups (Table 2). None of the patient’s conditions were ever life-threatening. In addition, there was no obvious difference with regard to the incidence of pneumonia between the two groups (HD 0.08 versus MD 0.10 per person-year, P=0.38). Other side effects, such as hoarseness, were also similar between the two groups (HD 5.7% versus MD 9.0%, P=0.41). Sputum-culture results were also surveyed, and the incidence of Streptococcal pneumonia infection was most common in the COPD patients with pneumonia. Significantly more patients in the MD group had Haemophilus parainfluenzae infections than those in the HD group (23.7% versus 11.8%, P=0.02). There were no mycobacterium specimens isolated in this study. No cases of tuberculosis were diagnosed, and no empirical antituberculosis medications were prescribed during the study period. Notes: *P<0.05; all values are shown as means ± standard deviation. Abbreviations: HD, high dose; MD, medium dose; GOLD, Global initiative for chronic Obstructive Lung Disease; FEV1, forced expiratory volume in 1 second; FVC, forced vital capacity; CAT, COPD-assessment test. This was the first prospective, randomized study to evaluate the efficacy and safety of different ICS doses in the treatment of COPD. Our data showed that therapy with higher ICS doses (fluticasone 1,000 μg/day) in patients with COPD improved lung-function status, decreased the frequency of acute exacerbations, and provided better improvements in symptoms and quality of life compared to those with medium doses of ICS treatment. Most importantly, the risk of developing pneumonia or other side effects did not differ between the two treatment groups. Our findings showed the better treatment efficacy of higher doses of ICS in patients with COPD. The pathogenesis of COPD is based on airway inflammation caused by cigarette smoke and/or in/outdoor fume exposure. Airway inflammation is characterized by increased numbers of neutrophils, macrophages, and CD8+ lymphocytes. Infiltration of inflammatory cells into the airways occurs in both early and late COPD. As the disease progresses, the small airways fill with inflammatory mucus exudates.27 The presence of inflammation in the airways provides a rationale for using ICS and LABA to treat the disease. Previous studies have documented that ICS treatment decreases the expressions of neutrophils and interleukin 8 in bronchoalveolar lavage fluid in COPD patients28 by suppressing the expressions of Toll-like receptor 4 and lipopolysaccharide-induced interleukin 8 in a dose-dependent fashion.29 Furthermore, ICS treatment has been shown to ameliorate airway-remodeling status by suppressing vascular endothelial growth factor and transforming growth factor-β expressions.30 In addition, ICS treatment has been shown to effectively alleviate inflammation mediators and recover innate immune responses, such as surfactant protein D.31 Our findings revealed the clinical benefits of ICS treatment in patients with COPD by improving lung function and relieving symptoms, especially with higher doses of ICS. The GOLD guidelines for the management of stable COPD strongly suggest that ICS regimens combined with a LABA should be prescribed for patients with group C, D, and/or frequent exacerbations.14,15 However, many case-controlled or retrospectively based studies have reported that ICS-containing regimens are an independent risk factor for an increased incidence of pneumonia,16–18,32–35 although other studies have reported a similar incidence of pneumonia between patients using MD and HD ICS treatment.25 Previous prospective studies had also shown that the annual incidence of pneumonia was no different whether using MD fluticasone (500 μg/day, 7%)36,37 or HD fluticasone (1,000 μg/day, 7%).19 We also found no increased incidence of pneumonia with either a MD or HD ICS in this prospective study (0.08 versus 0.10 [incidence per patient per year]). The major problem for these contradictive results might have arisen from the methodology of pneumonia diagnosis, or differentiation between pneumonia or virus infection-related acute exacerbation in COPD patients. For diagnosis of pneumonia, chest radiograph and sputum studies were important. Therefore, overdiagnosis of the incidence of pneumonia might exist from previous retrospective or case-controlled studies. If the development of pneumonia is not related to the dosage of ICS, then utilizing high doses of ICS in patients with COPD could be a preferable strategy, due to increased benefits and fewer harmful effects. The rate of pneumonia-related COPD mortality has yet to be clarified. Recent studies have reported that the use of ICS in patients with COPD is associated with a dose-related increase in the risk of pneumonia-related mortality.18,32,33 However, the results of our study do not support these findings, and evidence from randomized trials has also shown that a higher incidence of pneumonia is not associated with pneumonia-induced mortality or overall mortality.19,24,38,39 In summary, a higher dose of ICS dose seems to be a safe strategy to improve current COPD treatment. Several recent studies have documented an increased risk of tuberculosis in patients with COPD using ICS.40,41 However, in the current prospective study, no patients were diagnosed with pulmonary tuberculosis. The causal relationship between the incidence of tuberculosis and ICS usage should be further elucidated in large population-based prospective studies. A previous study reported that patients using ICS for asthma or COPD had a 34% increase in the development of diabetes mellitus;42 however, other case-controlled studies did not support this finding.43–45 In the current study, we did not find an increased incidence of hyperglycemia episodes or newly diagnosed cases of diabetes mellitus. Whether the dosage of ICS has an influence on glucose metabolism is still controversial, and further studies are needed to explore the relationship and mechanisms in depth. The pneumonia rate (per patient per year) was 0.08 in our study. This is similar to that found in the TORCH (TOwards a Revolution in COPD Health) study (0.07). The annual rate of exacerbation was 0.16 in the HD group and 0.34 in the MD group in the study, which is lower than those observed in previous studies (TORCH, 0.85;19 TRISTAN [TRial of Inhaled STeroids ANd long-acting β2 agonists], 0.9713). The reasons why the exacerbation rate was lower may have been be a high proportion of previous treatment with a long-acting β2 agonist, long-acting anticholinergic and inhaled corticosteroid, and better lung function before the commencement of the study (FEV1 46%–47% of predicted in this study; TORCH, 43%–44%; TRISTAN, 44%–45%; ISOLDE [Inhaled Steroids in Obstructive Lung Disease in Europe]). In addition, 12% of enrolled patients had an FEV1 of more than 60% in this study. There are a number of limitations to this study. First, we did not evaluate extrapulmonary side effects, such as osteoporosis severity or the development of cardiovascular events. Second, the airway pathophysiological mechanism for bacterial colorization and inflammatory cell recruitment after ICS treatment was not evaluated. Third, this was not a double-blinded study, and this may have biased the results. However, objective measurements, such as pneumonia development by chest-radiography and lung-function tests were analyzed to minimize such bias. Fourth, the present study was powered to detect an effect on lung-function improvement, and might have been underpowered to distinguish differences in pneumonia incidence. In conclusion, COPD patients treated with HD ICS showed improved lung-function status, decreased frequency of exacerbations, and greater symptom relief compared with those treated with MD ICS. Furthermore, no significant increase in the incidence of the development of pneumonia was noted, especially among those using HD ICS. This is the first prospective study to compare MD and HD ICS treatment in the effectiveness of COPD treatment, and to help determine the appropriate dose for an anti-inflammation response in patients with COPD. All authors contributed to the study, design, writing and revision of the paper. This study was supported by a grant from the Far Eastern Memorial Hospital (FEMH 2011-C-23). Decramer M, Janssens W, Miravitlles M. Chronic obstructive pulmonary disease. Lancet. 2012;379:1341–1351. Hunninghake GW, Crystal RG. Cigarette smoking and lung destruction. Accumulation of neutrophils in the lung of cigarette smokers. Am Rev Respir Dis. 1983;128:833–838. Kanazawa H, Kurihara N, Hirata K, Fujimoto S, Takeda T. The role of free radicals and neutrophil elastase in development of pulmonary emphysema. Intern Med. 1992;31:857–860. Barnes PJ, Shapiro SD, Pauwels RA. Chronic obstructive pulmonary disease: molecular and cellular mechanisms. Eur Respir J. 2003;22:672–688. Cosio MG, Majo J, Cosio MG. Inflammation of the airways and lung parenchyma in COPD: role of T cells. Chest. 2002;121:160S–165S. Bhowmik A, Seemungal TA, Sapsford RJ, Wedzicha JA. Relation of sputum inflammatory markers to symptoms and lung function changes in COPD exacerbation. Thorax. 2000;55:114–120. Fry AM, Shay DK, Holman RC, Curns AT, Anderson LJ. Trends in hospitalizations for pneumonia among persons aged 65 years or older in the United States, 1988–2002. JAMA. 2005;294:2712–2719. Farr BM, Bartlett CL, Wadsworth J, Miller DL. Risk factors for community-acquired pneumonia diagnosed upon hospital admission. British Thoracic Society Pneumonia Study Group. Respir Med. 2000;94:954–963. Restrepo MI, Mortensen EM, Pugh JA, Anzueto A. COPD is associated with increased mortality in patients with community-acquired pneumonia. Eur Respir J. 2006;28:346–351. Holguin F, Folch E, Redd SC, Mannino DM. Comorbidity and mortality in COPD-related hospitalizations in the United States, 1979 to 2001. Chest. 2005;128:2005–2011. Szafranski W, Cukier A, Ramirez A, et al. Efficacy and safety of budesonide/formoterol in the management of chronic obstructive pulmonary disease. Eur Respir J. 2003;21:74–81. Spencer S, Calverley PMA, Burge PS, Jones PW. Impact of preventing exacerbation on deterioration of health status in COPD. Eur Respir J. 2004;23:698–702. Calverley P, Pauwels R, Vestbo J, et al. Combined salmeterol and fluticasone in the treatment of chronic obstructive pulmonary disease: a randomized controlled trial. Lancet. 2003;361:449–456. Vestbo J, Hurd SS, Agusti AG, et al. Global strategy for the diagnosis, management, and prevention of chronic obstructive pulmonary disease: GOLD executive summary. Am J Respir Crit Care Med. 2013;187:347–365. Global initiative for chronic Obstructive Lung Disease. Global Strategy for Diagnosis, Management, and Prevention of COPD. Bethesda (MD): GOLD; 2013. Available from: http://www.goldcopd.org/uploads/users/files/GOLD_Report_2013_Feb20.pdf. Accessed April 12, 2014. Drummond MB, Dasenbrook EC, Pitz MW, Murphy DJ, Fan E. Inhaled corticosteroids in patients with stable chronic obstructive pulmonary disease: a systematic review and meta-analysis. JAMA. 2008;300:2407–2416. Singh S, Amin AV, Loke YK. Long-term use of inhaled corticosteroids and the risk of pneumonia in chronic obstructive pulmonary disease: a meta-analysis. Arch Intern Med. 2009;169:219–229. Ernst P, Gonzalez AV, Brassard P, Suissa S. Inhaled corticosteroid use in chronic obstructive pulmonary disease and the risk of hospitalization for pneumonia. Am J Respir Crit Care Med. 2007;176:162–166. Calverley PM, Anderson JA, Celli B, et al. Salmeterol and fluticasone propionate and survival in chronic obstructive pulmonary disease. N Engl J Med. 2007;356:775–798. Welte T, Miravitlles M, Hernandez P, et al. Efficacy and tolerability of budesonide/formoterol added to tiotropium in patients with chronic obstructive pulmonary disease. Am J Respir Crit Care Med. 2009;180:741–750. Sin DD, Tashkin D, Zhang X, et al. Budesonide and the risk of pneumonia: a meta-analysis of individual patient data. Lancet. 2009;374:712–719. Rennard SI, Tashkin DP, McElhattan J, et al. Efficacy and tolerability of budesonide/formoterol in one hydrofluoroalkane pressurized metered-dose inhaler in patients with chronic obstructive pulmonary disease: results from a 1-year randomized controlled clinical trial. Drugs. 2009;69:549–565. Tashkin DP, Rennard SI, Martin P, et al. Efficacy and safety of budesonide and formoterol in one pressurized metered-dose inhaler in patients with moderate to very severe chronic obstructive pulmonary disease: results of a 6-month randomized clinical trial. Drugs. 2008;68:1975–2000. Chen D, Restrepo MI, Fine MJ, et al. Observational study of inhaled corticosteroids on outcomes for COPD patients with pneumonia. Am J Respir Crit Care Med. 2011;184:312–316. Cheng SL, Wang HC, Cheng SJ, Yu CJ. Elevated placenta growth factor predicts pneumonia in patients with chronic obstructive pulmonary disease under inhaled corticosteroids therapy. BMC Pulm Med. 2011;11:46. Jones PW, Harding G, Berry P, Wiklund I, Chen WH, Kline Leidy N. Development and first validation of the COPD Assessment Test. Eur Respir J. 2009;34:648–654. Ozol D, Aysan T, Solak ZA, Mogulkoc N, Veral A, Sebik F. The effect of inhaled corticosteroids on bronchoalveolar lavage cells and IL-8 levels in stable COPD patients. Respir Med. 2005;99:1494–1500. MacRedmond RE, Greene CM, Dorscheid DR, McElvaney NG, O’Neill SJ. Epithelial expression of TLR4 is modulated in COPD and by steroid, salmeterol and cigarette smoke. Respir Res. 2007;8:84. Zanini A, Chetta A, Saetta M, et al. Bronchial vascular remodeling in patients with COPD and its relationship with inhaled steroid treatment. Thorax. 2009;64:1019–1024. Sims MW, Tal-Singer RM, Kierstein S, et al. Chronic obstructive pulmonary disease and inhaled steroid alter surfactant protein D (SP-D) levels: a cross-sectional study. Respir Res. 2008;9:13. Thornton Snider J, Luna Y, Wong KS, et al. Inhaled corticosteroids and the risk of pneumonia in Medicare patients with COPD. Curr Med Res Opin. 2012;28:1959–1967. Ryan M, Suaya JA, Chapman JD, Stason WB, Shepard DS, Thomas CP. Incidence and cost of pneumonia in older adults with COPD in the United States. PLoS One. 2013;8:e75887. Suissa S, Patenaude V, Lapi F, Ernst P. Inhaled corticosteroids in COPD and the risk of serious pneumonia. Thorax. 2013;68:1029–1036. Ferguson GT, Anzueto A, Fei R, EmmettA, Knobil K, Kalberg C. Effect of fluticasone propionate/salmeterol (250/50 microg) or salmeterol (50 microg) on COPD exacerbations. Respir Med. 2008;102:1099–1108. Anzueto A, Ferguson GT, Feldman G, et al. Effect of fluticasone propionate/samleterol (250/50) on COPD exacerbation and impact on patient outcomes. COPD. 2009;6:320–329. Malo de Molina R, Mortensen EM, Restrepo MI, Copeland LA, Pugh MJ, Anzueto A. Inhaled corticosteroid use is associated with lower mortality for subjects with COPD and hospitalised with pneumonia. Eur Respir J. 2010;36:751–757. Singanayagam A, Chalmers JD, Akram AR, Hill AT. Impact of inhaled corticosteroid use on outcome in COPD patients admitted with pneumonia. Eur Respir J. 2011;38:36–41. Kim JH, Park JS, Kim KH, Jeong HC, Kim EK, Lee JH. Inhaled corticosteroid is associated with an increased risk of TB in patients with COPD. Chest. 2013;143:1018–1024. Lee CH, Kim K, Hyun MK, Jang EJ, Lee NR, Yim JJ. Use of inhaled corticosteroids and the risk of tuberculosis. Thorax. 2013;68:1105–1113. Suissa S, Kezouh A, Ernst P. Inhaled corticosteroids and the risks of diabetes onset and progression. Am J Med. 2010;123:1001–1006. O’Byrne PM, Rennard S, Gerstein H, et al. Risk of new onset diabetes mellitus in patients with asthma or COPD taking inhaled corticosteroids. Respir Med. 2012;106:1487–1493. Dendukuri N, Blais L, LeLorier J. Inhaled corticosteroids and the risk of diabetes among the elderly. Br J Clin Pharmacol. 2002;54:59–64. Blackburn D, Hux J, Mamdani M. Quantification of the risk of corticosteroid-induced diabetes mellitus among the elderly. J Gen Intern Med. 2002;17:717–720.